Economist Ronan Lyons talks Airbnb, the Budget and why the market is improving (sort of). IF YOU’VE BEEN trying to navigate the housing market during the last few years, it hasn’t always been easy – housing shortages have made things difficult for both renters and buyers. The good news as we head into 2019 is that those shortages are slowly getting smaller, giving us more choice when it comes to where and how we live. That’s all according to economist Ronan Lyons, who last week took a look back at property in 2018. Here’s how he shares his thoughts on how the property market will change in 2019. It’s more that the rate at which things are getting worse is going to slow down – the increase in construction means the housing shortage will get smaller in 2019. 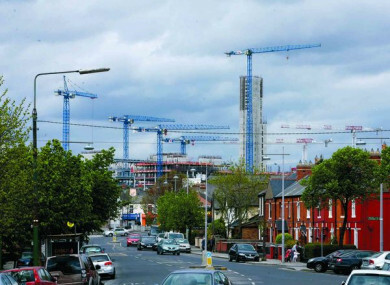 Lyons says that although the market will still be dominated in Dublin – which is seen by developers as currently more viable than elsewhere, we’ll start to see the apartment market pick up in our other cities. “We’ll see more planning permission granted outside the greater Dublin area”, such as apartment developments breaking ground in both Cork and Galway. Next year will see the introduction of penalties of up to €30,000 brought in for landlords who breach rent caps (Lyons explained last week why rent caps haven’t been as effective as we’d hoped), which is a step in the right direction but not a solution. “I think sitting tenants already have it pretty good as many landlords already abide by these laws and it’s difficult to see how it will have a big impact on moving tenants,” he says. “There will probably be a small effect but the size of Airbnb stock is grossly overstated. People talk about 5,000 homes in Dublin being on Airbnb.” Lyons says that the full-time housing on the site is more in the realms of 1,000-1,500 homes, which is equivalent to about a week’s worth of demand. Email “5 trends set to define the property market in 2019, according to an expert”. Feedback on “5 trends set to define the property market in 2019, according to an expert”.